Check out part one and part two of this series. 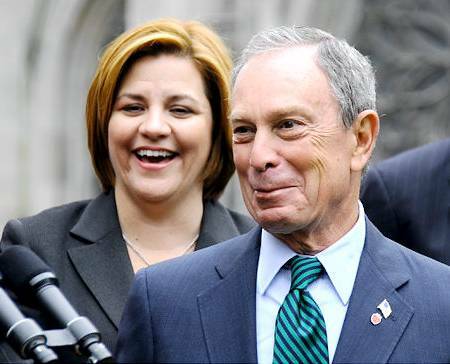 Ever since she shepherded legislation permitting Mayor Bloomberg a third term through the City Council, Speaker Christine Quinn has struggled to shed her image as a Bloomberg deputy among the progressive base that will determine the 2013 Democratic mayoral primary. Quinn had been considered (along with the now-disgraced Anthony Weiner) as a leading contender for the 2009 mayoral race prior to the change in term limits, and had been fundraising aggressively in anticipation of that race. Today we’ll take a look at who some of her biggest supporters have been. So how do you raise $5 million for a mayoral election? Quinn has had 6,020 donations (including repeat donors) to her campaign, which averages out at $845 per contribution. The two biggest sources of funds are real estate companies and corporate law firms. On the real estate side, Quinn has raised more than $43,000 from Liberty Title, $33,000 from Related Companies, $27,000 from CB Richard Ellis, $15,000 from Cushman & Wakefield, and $14,500 from Vornado. Individuals who have bundled over $25,000 for her include Mario Palumbo (Millenium Partners Real Estate), David Belt (self-employed developer), William Zeckendorf (Zeckendorf Realty), MaryAnn Tighe (CB Richard Ellis), Caryn Eyring (Taconic Real Estate), Jay Kriegel (Related Companies) and Robert Speyer (Tishman Speyer). Last post I commented on white-shoe firm Paul, Weiss delivering more than 50 donors to the Quinn campaign, but it turns out that the Gibbons law firm actually has donated more in total contributions, at $55,000 (to $34,000 for Paul, Weiss). I’ve never heard of the mid-sized Gibbons firm, and though it has offices in both New Jersey and New York, most of the donors were from New Jersey. The renowned Skadden, Arps clocks in at $27,000, followed by Sullivan & Cromwell ($23,500) and Weil, Gotchel ($21,000). Significant bundlers include two attorneys from Gibbons and one from Paul Hastings. It should be noted that this numbers are all low-ball estimates, as donors fill out their places of employment using a variety of monikers and acronyms. John Zuccotti, chair of Brookfield Properties, contributed $1,000. Zuccotti is best known as the namesake to the now famous home of the 2011 Occupy Wall Street encampment. The contribution was made before OWS began. Former mayor Ed Koch contributed $1,000. Koch seemingly gave Quinn his blessing, calling her a “liberal with sanity”, but he has been critical recently, and is actively pushing Police Commissioner Ray Kelly to enter the race. Fred Wilson, CEO of Union Square Ventures and hero to the start-up community, maxed out at $4,950. Eugene Zagat, co-founder of the dining guide empire, also maxed out. It’s too early in this process to start connecting the dots. People can have motives for donating to campaigns other than peddling unseemly influence. After all, I’ve contributed to plenty of campaigns out of the belief that the candidate would be a positive force for my city or country. And $1000 might not seem like a big deal for a wealthy Park Avenue type. That said, bundlers and companies that have raised significant sums of money just might be looking for something in return down the road. Right now we’re just getting up on the wire. I’d appreciate your help in the coming months to get to the bottom of what that might be. This entry was posted in Political ramblings and tagged 2013 Mayors Race, Gibbons, Liberty Title, Related, Skadden Arps, Speaker Quinn, Sullivan & Cromwell, Vornado. Bookmark the permalink.